The Capitol Mall is not the best location for a restaurant. Somehow Il Fornaio seems to survive quite well but 55 Degrees did not. Too bad. I liked it. Now in that spot is House, which has been open for about six months now. They are aware of the location hurdles - they aren't open on the weekends. Supposedly it's hopping and full during lunches, and does OK for weeknight dinners. I went in for dinner midweek and found it about half full. I had decided to use one of my Groupons. I've always bought half-off restaurant deals, but always used them with a date or friend. Then I recently realized that there is nothing on the gift certificates that say you have to eat with someone. Why share the discount? So I went off to dine alone at the bar and take the full advantage of the certificate just for me. House has been getting mixed reviews of late, even from repeat customers. A friend who works in the building eats there often and at first was all raves about it. Then recently he and his partner had had some disappointing meals there which put a damper on their enthusiasm. I'll be giving them a second try again later since I bought two Groupons for House. I placed my order for the Cajun shrimp appetizer and the beer can chicken entree. The guys next to me said the chicken was excellent. Good to know until it turns out it was sold out. Guess it is a favorite. So I opted for the steak. 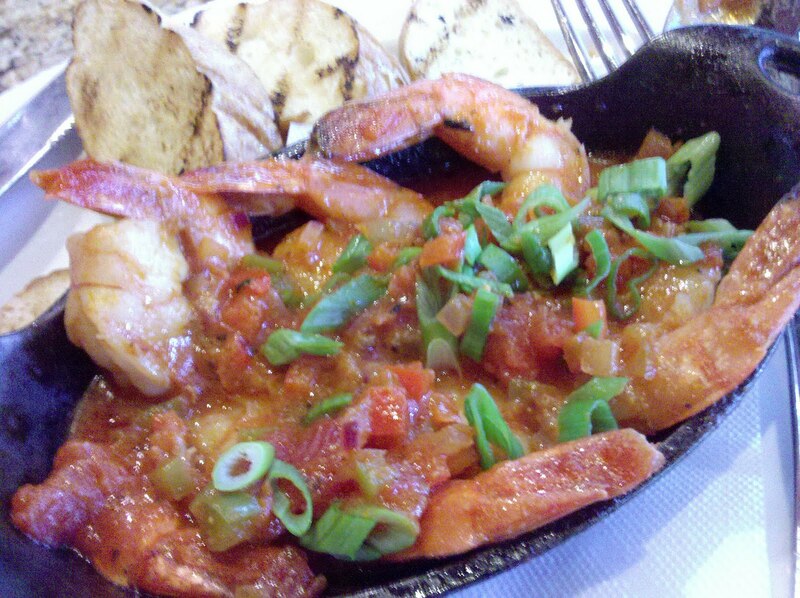 Anyway, the Cajun shrimp came with about seven shrimp and four toasted baguette slices for dipping. The shrimp was perfectly cooked but I found the overall flavoring dull. Cajun implies spice and I felt very little heat except for temperature-wise. Overall, it was ho-hum and I just ate the shrimp up and left the rest since it held little interest for me. The steak came out looking very nice and perfectly cooked to my medium rare request. 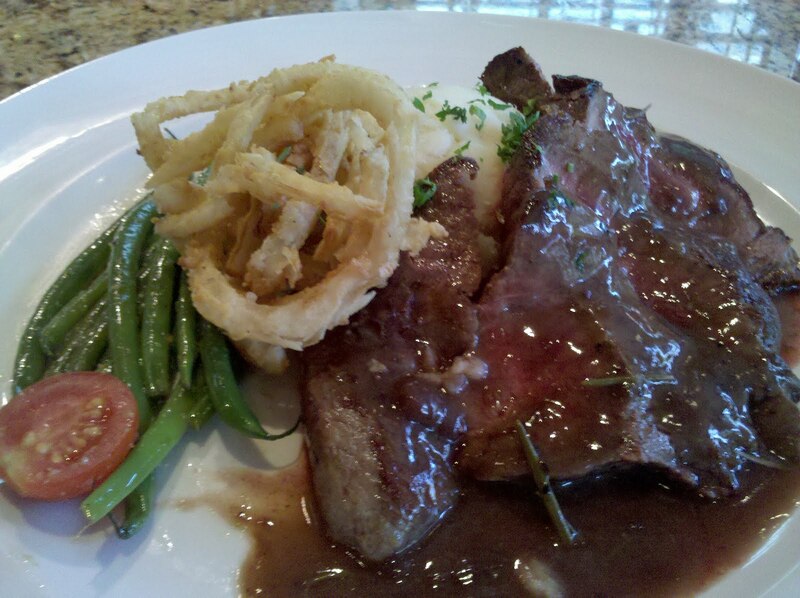 It was served with crispy onions, green beans, and mashed potatoes. The sauce was a red wine demi-glace. I found the onions to be indeed crispy and grease free. But the batter was again a case of blandness. Normally I love onion strings, but these were rather disappointing flavor-wise. I loved the green beans. They were very thin and yet they were cooked to perfection - with just the right amount of crispness. The mashed potatoes were nothing special and I left most of them behind. I'm a small eater and learned to eat the money on the plate first - the meat. I enjoyed the steak as well. It was a little more to the rare than the medium rare side, but that didn't bother me. It was tender and the portion size was good. I had thought I'd be taking home leftovers, but found myself eating the whole thing. There was plenty of the demi-glace so that I didn't run out and it was very tasty. 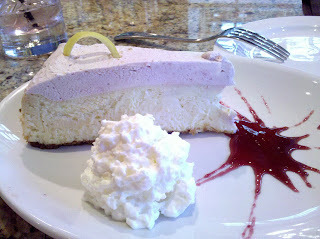 I always ask about dessert and the bartender checked and found that one option was the raspberry lemon cheesecake. I asked if they made their desserts in-house and he said they did. Out came a very nice cheesecake. The cheesecake had a thin, crumbly graham cracker crust. I liked that it wasn't too much and that it wasn't hard either. Then the lemon cheesecake was a great, smooth density. On top was a layer of raspberry flavored whipped cream. I had thought it would come out differently, with the raspberries incorporated in the cheesecake, but found this topping to be a nice compliment. I'd end by saying that my first experience was right in line with what I had heard - mixed. There were good points and bad points to my meal. I look forward to my second try in the future.